This post is sponsored by Study.com. All opinions are my own. The Study.com Teacher’s Edition is a new way to engage your students inside and outside the classroom. 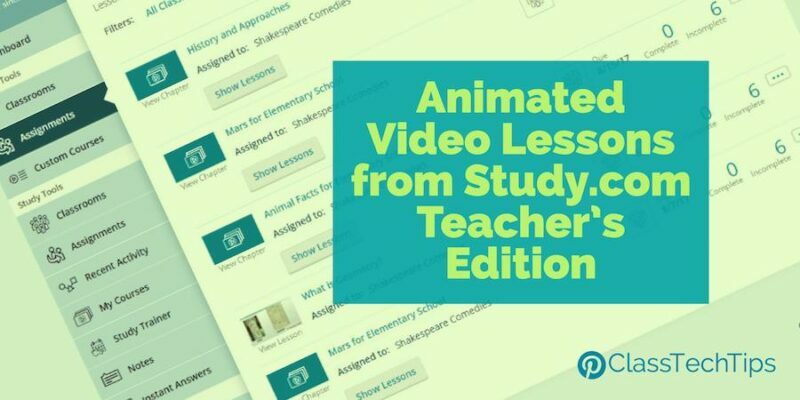 They provide teachers with access to animated video lessons to share with students. You’ll also find a virtual classroom to help manage resources. Teachers can use this virtual space to stay organized with assignments, gradebooks, lesson plans and more. If you haven’t checked out Study.com before, it includes 20,000 short video lessons accessible to users through a computer or mobile device. There are over 4,500 easy-to-follow lesson plans. You’ll also find a virtual classroom where you can assign lessons and quizzes for student. Then they can complete them at home or as part of an in-class activity. There are customizable courses as well as virtual and printable flashcards for students. Study.com’s mission is to make education fun and accessible to all learners so there is access for up to 250 of your students as well as professional development resources for teachers. 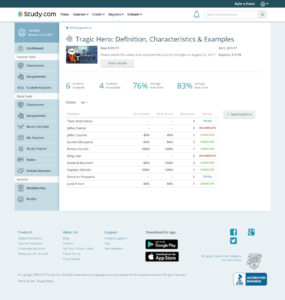 There are a few new features of Study.com. This includes printable exams and answer keys to use in class and assignable exams for students to take at home. You’ll also find a gradebook with student scores. Coming soon, there will be the option for single sign on with Google Classroom. With thousands of teacher resources Study.com is worth checking out. There is easy access to lesson plans and activities for students and teachers can use the virtual classrooms feature to easily assign and track homework assignments from any device connected to the Internet. If you head over the Study.com’s website you’ll find lots of answers to frequently asked questions and a short video too. Visit Study.com’s website to learn more and use the coupon code CLASSTECH20 for 20% off the full Teacher Edition for the first six months (new members only – coupon expires September 30, 2017).